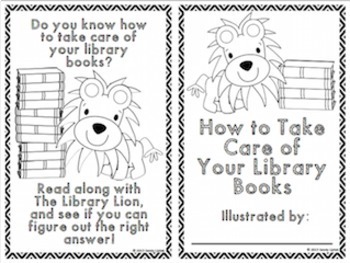 This activity can help you teach and review the proper way to take care of library books with the younger grades using the book "The Library Lion" by Michelle Knudsen. 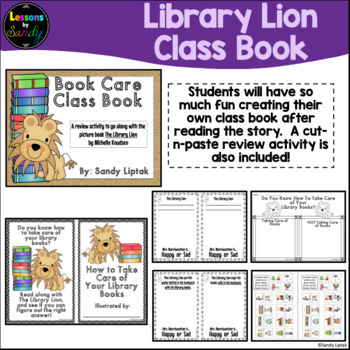 I typically do this activity with 1st grade, and have purchased a small, stuffed lion to have as our reminder “mascot” throughout the year. 1. 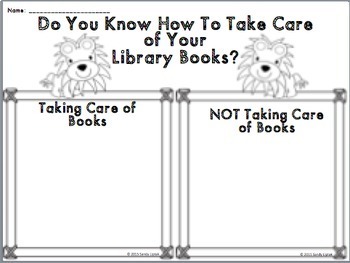 Introduce the students to the Library Lion and show the stuffed animal (if you have one). 2. Read the book to the students. 3. Print the front and back cover, cut them apart, and laminate them. 4. Copy the ten pages and hand out a half page to each student. Read the statement to the student and let them illustrate the page. 5. Staple the students’ illustrated pages inside the covers, and give the book to the students to keep in their classroom or keep them in the library for students to read. 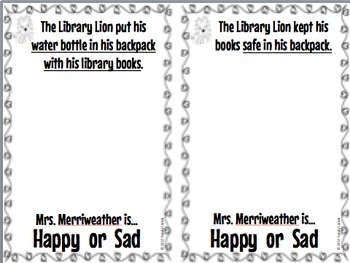 OPTIONAL: You can also laminated each student page. *I’ve included an additional page in case you want your students to come up with their own examples.